Use these instructions to create your CSR (certificate signing request) and then, to install your SSL and intermediate certificates. After receiving your SSL Certificate, you need to install it on your NetScaler VPX device and then, you can bind it to your virtual server. Log into your Management Tool. On the SSL Certificates tab, in the list of your current certificates, select the order number for your new Citrix NetScaler VPX SSL Certificate. On the Manage Yourâ€¦Certificate - Order page, under your Server Certificate image, click Download as .zip. Save your SSL Certificate combined .pem file (i.e. yourdomain_com.pem) to your Citrix NetScaler VPX device. 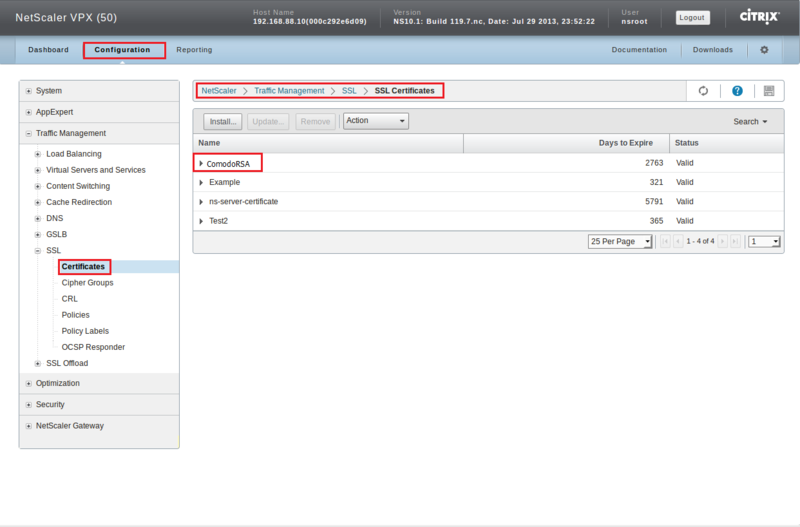 Log into your NetScaler device console. 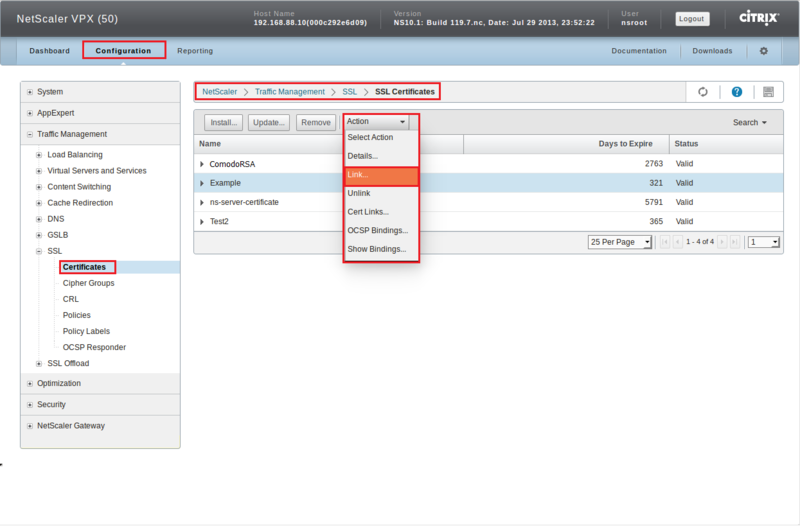 In the NetScaler console, on the Configuration tab, in the tree menu, expand Traffic Management and then click SSL. 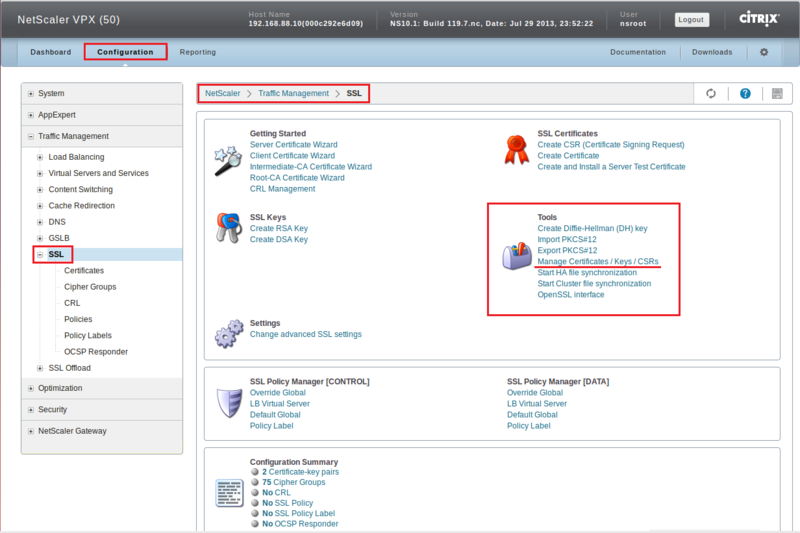 On the NetScaler > Traffic Management > SSL page, under Tools, click Manage Certificates / Keys / CSRs. 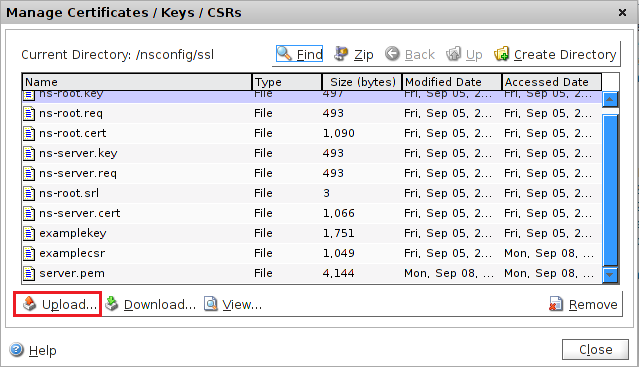 In the Manage Certificates / Keys / CSRs window, click Upload to locate, select, and upload your SSL Certificate .pem file (i.e. yourdomain_com.pem). 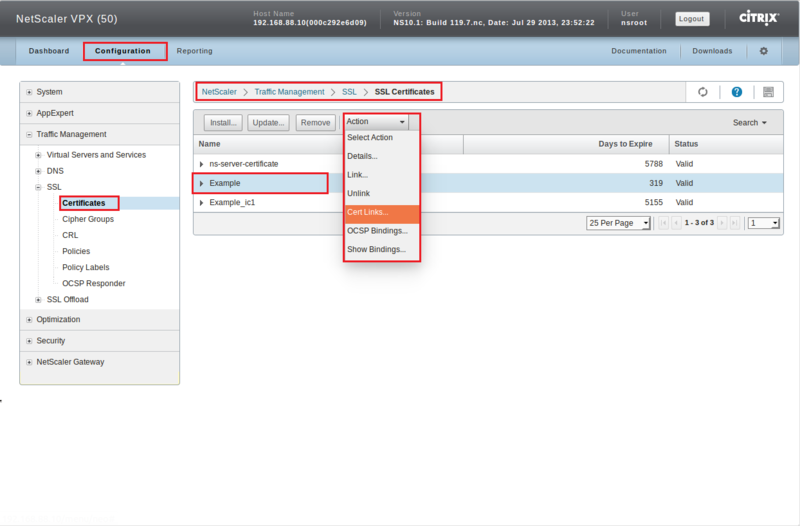 In the NetScaler console, on the Configuration tab, in the tree menu, expand Traffic Management > SSL and then click Certificates. On the NetScaler > Traffic Management > SSL > SSL Certificates page, click Install. Certificate-Key Pair Name* Create a name for the certificate (i.e. Example). Certificate File Name* i. In the Browse drop-down list, select Appliance. ii. Click Browse to browse to and select your SSL Certificate file (i.e. /nsconfig/ssl/yourdomain_com.pem). iii. Click Select and then click Open. Key File Name i. In the Browse drop-down list, select Appliance. ii. Click Browse to browse to and select your RSA key file (i.e. /nsconfig/ssl/example.key) that you created. Password Enter the password that you used when creating your CSR. Certificate Bundle Check this box. If you do not have the Certificate Bundle feature, finish installing your SSL Certificate. Then, follow the instructions in the Certificate Bundle Note. 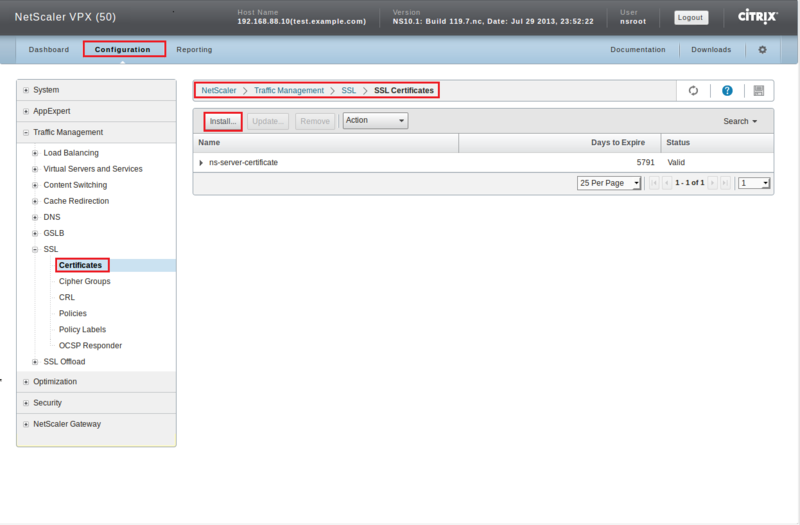 Notify When Expires Select Enabled to be notified before your certificate expires. Notification Period Enter the number of days before the certificate expires that you want to be notified. On the NetScaler > Traffic Management > SSL > SSL Certificates page, your SSL and Intermediate Certificates are added to the list of certificates. Your SSL Certificate is listed by the name that you created for it during installation (i.e. Example) and the Intermediate Certificate is listed by that same name with _ic1 appended to it (i.e. Example_ic1). If you do not have the Certificate Bundle option, you see only your SSL Certificate (i.e. Example). Certificate Bundle Note: If you do not have the Certificate Bundle feature, you need to install the XYZRSACA Intermediate Certificate before binding your SSL Certificate to a virtual server. On the NetScaler > Traffic Management > SSL > SSL Certificates page, select your SSL Certificate (i.e. Example). In the Actions drop-down list, select Cert Links. In the SSL Certificate Links window, the _ic1 certificate should be listed as the CA Certificate Name for your SSL Certificate (i.e. Certificate Name: Example and CA Certificate Name: Example_ic1). 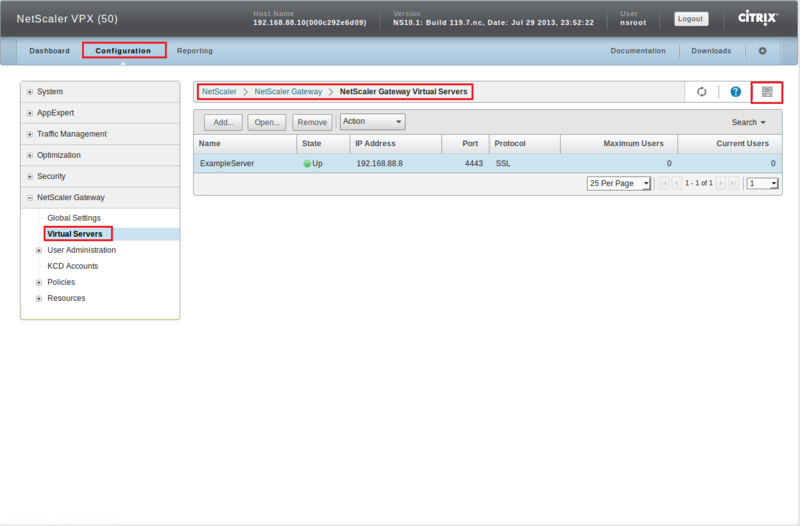 In the NetScaler console, on the Configuration tab, in the tree menu, expand NetScaler Gateway and then click Virtual Servers. 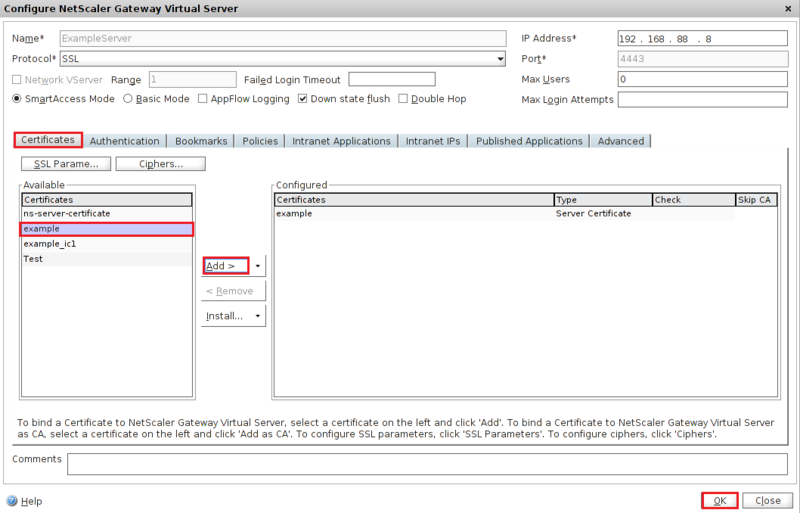 On the NetScaler > NetScaler Gateway > NetScaler Gateway Virtual Servers page, select the virtual server to which you want to bind your certificate and then click Open. In the Configure NetScaler Gateway Virtual Server window, on the Certificates tab, in the Available section, select your SSL Certificate and then click Add. In the Configured section, select the old certificate (i.e. Test) used to configure the virtual server and click Remove. On the NetScaler > NetScaler Gateway > NetScaler Gateway Virtual Servers page, in the upper right corner click the save symbol (diskette). You have successfully installed and configured your Citrix NetScaler SSL Certificate. To verify that you correctly configure the SSL Certificate, use https to visit your website. On the My Orders tab, in the list of your current certificates, select the order number for your Citrix NetScaler VPX SSL Certificate. 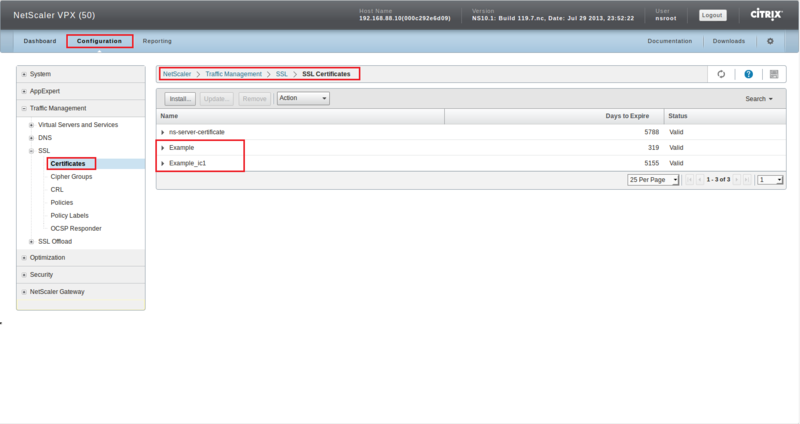 On the Manage Yourâ€¦Certificate - Order page, under your Server Certificate image, click Download. Save the XYZRSACA.pem intermediate certificate file to your Citrix NetScaler VPX device. 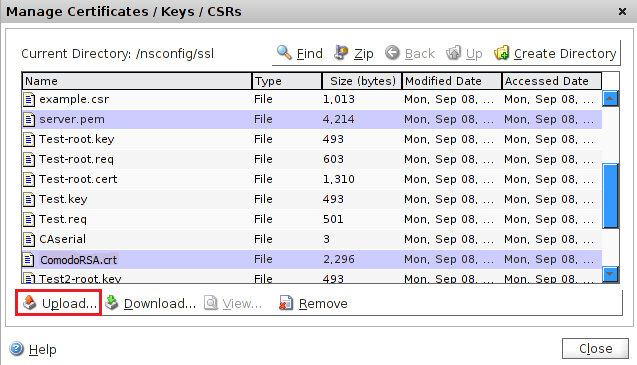 In the Manage Certificates / Keys / CSRs window, click Upload to locate, select, and upload the XYZRSACA.pem file. Certificate-Key Pair Name* Enter XYZRSACA. ii. Click Browse to browse to and select the XYZRSACA.pem file (i.e. /nsconfig/ssl/XYZRSACA.pem). Key File Name N/A (leave blank). The XYZRSACA.pem file is .pem formatted; it just uses a .pem extension. 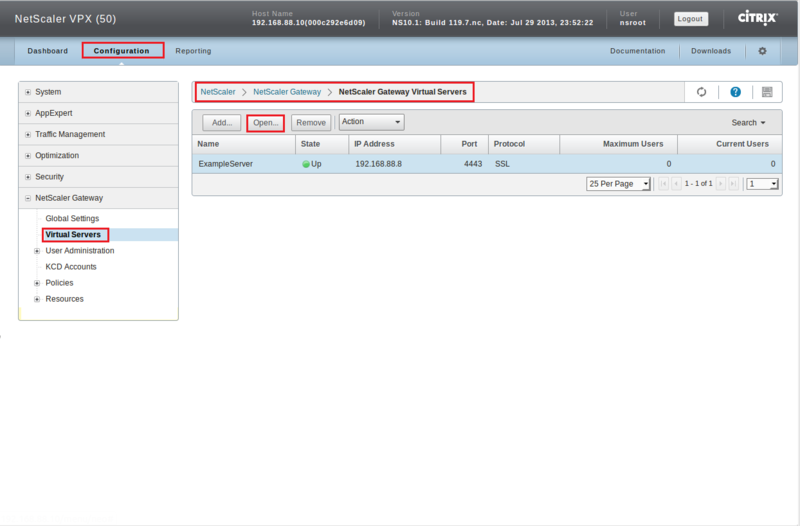 Citrix NetScaler VPX, you will not see this option. Notify When Expires Do not check this box. On the NetScaler > Traffic Management > SSL > SSL Certificates page, the XYZRSACA intermediate certificate is added to list of certificates. You are ready to link your SSL Certificate to the XYZRSACA Intermediate Certificate. On the NetScaler > Traffic Management > SSL > SSL Certificates page, select your SSL Certificate (i.e. Example) and then in the Actions drop-down list, select Link. In the Link Server Certificate(s) window, in the CA Certificate Name* drop-down list, select XYZRSACAand then, click OK. Your SSL Certificate is now linked to its intermediate certificate (XYZRSACA.pem).